Back Numbers --- Three tips for Better enjoying Mini-Van! --- > CHAPTER3 Body rigidity parts > CHAPTER2 Reinforced Sway bar > CHAPTER1 Fully ride-height adjustable coil over ------------------------------------------------------------- What's important when selecting coilover kit! Does it really work? BRING BACK THE SPORTINESS WITH AN LSD! 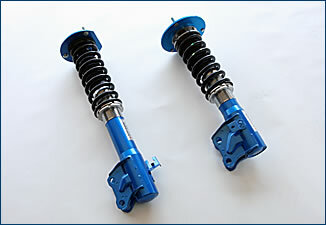 Assembled with fully threaded shock absorber, that provides you good amount of stroke at any vehicle height. 5way adjustable damper will match your driving stages, loaded weight, and even to your technique. Dampers, spring seats and case lock nuts are made of stainless steel material. Even the internal threads inside the lower bracket has solid rust proof coating as well, to make whole kit a rust-proof. When used with “e-con”, the remote damping rate controller, you can adjust the damping rate from your driving seat. This will provide you easy access to tune the damper in different situations such as family day trip, to the track event day. To change the damping manually, open the hood, and click the dial with the attached tool. For those who prefer to change setting frequently, e-con is highly recommended. Changing the damping rate will be effective not only for the sporty driving, but will worth adjusting when you have more passengers, change the tire to and from comfort/sport spec. Side port rotary valve system is adopted as its adjusting method. This system will suit from commuting to track event, as each click will provide you evident change and performance is always stable. In standard kit, upper mounts in front are assembled with camber adjustable pillow ball bushing on McPherson strut type vehicle, and hyper rubber bushings on non-McPherson strut type. If you choose optional Pillow ball kit, both front and rear upper mounts are assembled with Pillow ball bushing on any type of vehicle. To improve the anti-rust performance, stainless steel material is used on many parts, and rust proof paints are used even to the internal sections. In addition to such material issues, we have done very severe test to suit JIS (Japan Industrial Standard) Z2371 regulation. Thread sections on the damper, lock nuts, and lower seats are qualified with JIS.Z2371 standard, by passing a test with salty water sprayer for more than 500 hours. 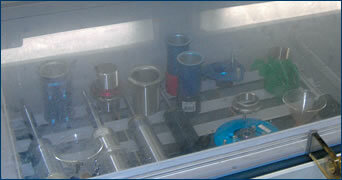 You do not need to worry about rusting and jamming problems with CUSCO's coilover kit, after all those severe tests. 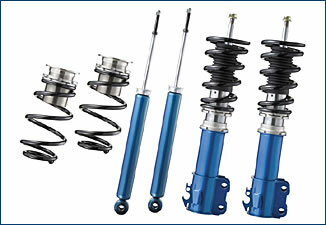 When you purchase the coilover kit, you can change from standard springs to other rate ones. In combination with adjustable dampers, you can tune your kit to your preference. For vehicle height adjustment, fully threaded shock absorber is adopted, as it won't sacrifice the damper stroke at any height setting. This is what traditional threaded type could not archive for many years. On this new system, you can take both advantage of the performance and styling. By the way, also on a fully threaded type coilover kit, you can choose to add some pre-load by adjusting the spring lower seats like you did on traditional ones. 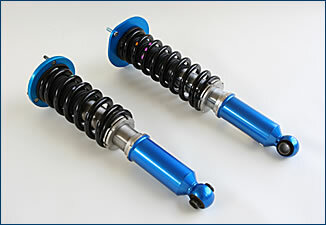 By adding pre-load, coilover kit works similar to the performance of the ones with stiffer springs. By adjusting the spring lower seats upward, you can add the pre-load to the springs. This way, you can adjust the steering response and ride comfort. Control panel and control unit. As they are separate, finding location for the control panel is very easy. Install the stepped motor on top of the ZERO-2E adjusting dial, with the unique stay. 100(L)x30(W)×30(H)mm compact panel makes installation and wiring easier. Biggest issue of the “e-con” is that you can adjust the dampers from driving seat. You can easily try different settings, and 6 different combinations are memorized. You can pre-set different settings from traveling with your family, to the circuit track situations. 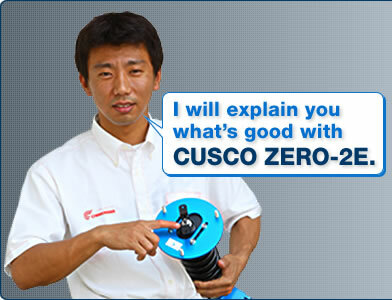 CUSCO has wide range of products beside the ZERO-2E. Check out the difference and find what is most suitable to you. 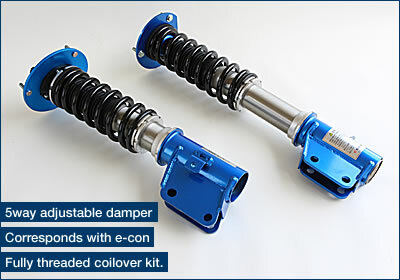 ZERO-1 is the fully threaded coilover kit with non-adjustable damping rate. Mainly targeting on comfortable ride, but also aiming for the sporty driving. Lock nuts, spring seats, and other parts are assembled with Stainless steel material to perform against rusting. You can up grade to ZERO-2/2E spec with 5 stage adjustable shock absorbers, when you overhauling the kit. ZERO-2 has 5 stage adjustable dampers. It provides comfortable ride, and also can be tuned to suit the condition in circuit tracks. And ZERO-2 also has all those rust proof materials. Remote damping rate controller “e-con” does not fit on ZERO-2 series, but the performance is completely same as ZERO-2E. As you can feel from the sound of “R”, ZERO-2R is suitable for Racing scenes too. And it also stands for the Ram, the inverted shock absorber. The inverted damper provides you both improved strength, especially against lateral inputs, and also the less unsprung weight. With patented technology of oil circulating system, friction of the damper is minimized to the lowest. This provides you comfortable ride, and also the maximized tire grip and traction. With its 5way damper, ZERO-2R is suitable in any situations from city to the circuit track. Stainless steel material adds easy access for height adjustment, and longer life time. Delivered at most recommended height and damper rate, good for the beginners, and new comers. The kit provides you sporty performance and appearance in reasonable price, by removing some functions and performances that would be too much for some people. Get the performance and cool style with COMP-S. Lock nuts and Lower seats are made of stainless steel to avoid rusting. This series is specialized in compact cars and K-cars. Delivered at most recommended height and damper rate, the kit is good for the beginners too. Non-adjustable damper and traditional partially threaded adjuster are same as the Comp-S. As most of those cars have separate rear springs and dampers, the kit comes with special height adjuster in the rear for most of the applications. 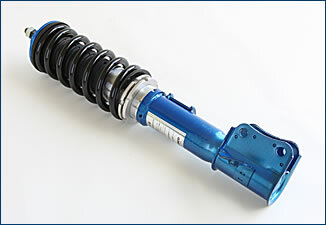 Like any other coilover kits from CUSCO, it comes with full rust-proof spec with stainless materials in adjusting parts. 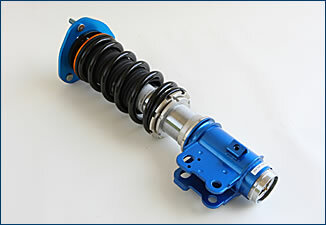 Fully threaded coilover kit specially made for Compact cars and K-cars. Like other CUSCO ZERO-series, you can lower the vehicle without sacrificing damper stroke, which provides you much lower appearance and better driving performance with comfort. In most of Compact-ZERO-1 applications, the kit comes with special height adjuster in the rear. 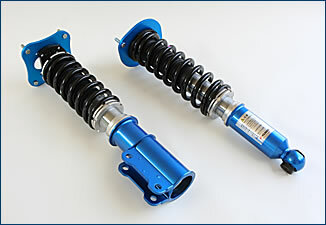 Like any other coilover kits from CUSCO, it comes with full rust-proof spec with stainless materials in adjusting parts.